NEW ORLEANS – Despite nationwide action this past weekend there wasn’t a lot of change to be had in the latest edition of the NCAA Division I Women’s Outdoor Track & Field National Rating Index which was released by the U.S. Track & Field and Cross Country Coaches Association (USTCCCA) on Monday. The main reason for the lack of movement wasn’t the fact that meets weren’t going on, it’s just that a slight lull should be expected after one of the biggest weekends so far this outdoor season occurred just the week before that produced outstanding results. Southern California is No. 1 for the third week in a row. Only two new athletes entered the TFRI Individual Rankings after performances this past weekend at the Jim Click Shootout. The women to join the ranks this week were Kyra Constantine (now ranked 28th in the 400) and Bailey Lear (34th in the same event). The team ranking sets a new program-best for consecutive weeks spent in the No. 1 spot for USC, replacing the old mark of two that was achieved just last season. Moving up one spot to No. 2 was Texas A&M. The Aggies hosted The Reveille Meet, which was the first outdoor meet held on Texas A&M’s campus since 2004, and saw two athletes also join the individual index ratings as well in Syaira Richardson (now 14th in the 400) and Gabrielle McDonald (28th in the 100H). Dropping a single spot to No. 3 was Arkansas. The Razorbacks were also at The Reveille Meet and saw its top performance come from G’Auna Edwards who is now 18th overall as an individual in the long jump in the index ratings. Jumping up a spot to No. 4 was Oregon. The Ducks flew south to the Sun Angel Track Classic over the weekend and got top showings out of Susan Ejore (who is now 11th overall in the 800 in the individual rankings) and their 4×400 unit (which is now ranked 10th). Switching spots with them to fall one into No. 5 was LSU. The Tigers hosted the Battle on the Bayou which was the first of three outdoor home meets for the program. No marks from the weekend were added to the National Rating Index. The rest of the top-10 was rounded out by Florida, Florida State, Alabama, Kentucky and Miami (Fla.), in that order. The biggest shakeup in the top-25 occurred between the No. 12-19 spots. The biggest gainers in this group were No. 19 BYU (up five spots) and No. 12 Kansas State (up four). The largest overall jump was taken by No. 105 Jacksonville as it improved 49 spots from Week 1. Other large gains were seen from No. 66 North Dakota State (up 46 spots), No. 88 Princeton (up 30), No. 93 Wofford (up 28) and No. 43 North Carolina (up 23 spots). 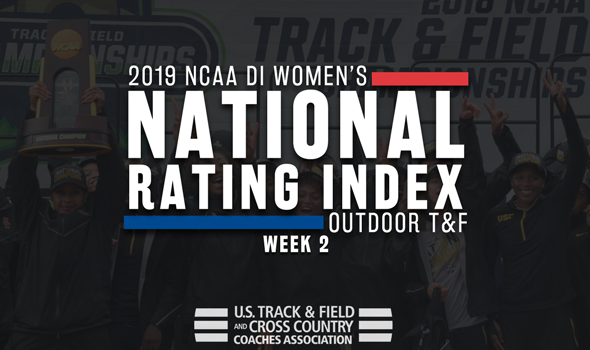 The next NCAA DI Women’s National Track & Field Rating Index will be released on Monday, April 15.